April 2017 Webinar: Revisiting the Privacy Rule! Description: This webinar revisits the foundation of the Privacy Rule in light of the fact, due mostly to Breach Notification, that the Security has taken most of the oxygen out of the room. HIPAA OCR Enforcement under Trump? The entire premise of this article is that HIPAA and Cybersecurity ("CS") are one and the same. The reason we believe this premise is true will be elaborated upon during the remainder of this article but the foundation rests upon the fact that the HIPAA Privacy Rule ("PR"), Security Rule ("SR"), and Breach Notification Rules ("BNR") (collectively "the Rules" or "Rules") are foundational components of CS. Through force of law only covered entities and business associates are required to comply with the Rules. However, either through new law, or vis-à-vis industry enforced compliance regimes, something akin to the Rules will be required of every significant industry you can think of. Why? Because now there is widespread consensus on both sides of the aisle, end everything in between, that there is little that distinguishes CS from national security ("NS"). The "Russian Hack" that dominates news cycle after news cycle is best understood as a "declaration of war." So far, little is understood regarding whether our response has been proportional or not, but one thing is clear, our response was not a "one off" exercise but continues unabated as we speak. Although as a news item the focus has currently been on whether, and to what extent, the Trump campaign colluded with the Russians, that "story behind the story" is that the Russian Hack raises the prominence of CS on that national consciousness more than one-hundred HHS/OCR/NIST conferences could have accomplished, even if all the best and brightest usual suspects were in attendance. Cybersecurity Overview-the $$ quote from this section is as follows: Cyberspace is particularly difficult to secure due to a number of factors: the ability of malicious actors to operate from anywhere in the world, the linkages between cyberspace and physical systems, and the difficulty of reducing vulnerabilities and consequences in complex cyber networks. Of growing concern is the cyber threat to critical infrastructure, which is increasingly subject to sophisticated cyber intrusions that pose new risks. As information technology becomes increasingly integrated with physical infrastructure operations, there is increased risk for wide scale or high-consequence events that could cause harm or disrupt services upon which our economy and the daily lives of millions of Americans depend. In light of the risk and potential consequences of cyber events, strengthening the security and resilience of cyberspace has become an important homeland security mission. How Do CS and HIPAA Overlap? Even those with a cursory understanding of the HIPAA SR should be able to quickly see the overlap between the SR implementation specifications (i.e. Security Controls) and those actions that must be taken by the private sector, NGOs, and the U.S. Government to protect against cybersecurity threats. The SR is nothing more than CS 101. It is a necessary but not sufficient step in protecting against the harms that are implicated by CS-harms that go way beyond damages that can be inflicted upon a single entity. The obvious link between cybersecurity and national security are beyond dispute after the Russian Hack. However, they should have been undisputed going as far back as 2010 when the U.S. and Israel allegedly unleashed Stuxnet to take down one of Iran's nuclear reactors. Stuxnet put the world on notice as to the offensive cybersecurity capabilities that the U.S. possessed. Surely, if the U.S. were capable of shutting down an Iranian nuclear reactor, then shutting down the Russian grid would not be a stretch. It is widely believed now that numerous countries have the capability of shutting down each other's respective grids. The "Russian Hack" was meant to send a different kind of message: We have the offensive weapons to disrupt the very fabric of your social order, including unleashing thousands (if not hundreds of thousands) of "fake news bots" capable of winning over the hearts, minds, and votes of a critical mass of U.S. citizens. In other words, the Russians demonstrated that they could weaponize anarchy. In a world where nuclear war is still governed by the principle of mutually assured destruction ("MAD") the Russians' demonstration is arguably far more insidious and destabilizing. Moreover, the Russians, who are allegedly ruled by a small group of criminal oligarchs, can conduct this kind of attack with little or no repercussions vis-à-vis world public opinion. If the consensus national security opinion in the U.S. has already concluded that Russia is nothing more than a mafia with a flag, then we can't be surprised when it behaves in a manner we have already ascribed to it. There is simply to no way imaginable that the Trump administration can appear to be weak on cybersecurity. To do so would be to contribute to a narrative that they are trying to dispel on a daily basis. Weakening the enforcement of the HIPAA SR, which after all applies to one-fifth of the economy, would be tantamount to surrendering on the cybersecurity front. We can't have mission critical infrastructure left wide open to ransomware and other malicious cyberattacks. That would certainly endanger lives and be political suicide for an administration that already has more than its share of problems. There is NO WAY that we are going to see the Trump, or any other future administration, go soft on HIPAA. It is NOT going to happen! Going soft on HIPAA is synonymous with going soft on national security. First of all, politically, that's simply not the American way. Second, the U.S. body polity would never stand for it. HIPAA is, and will remain, the law of the land. Any discussion of changing it will only be to strengthen it. 1. Compliance always exists along a continuum where full compliance is often nothing more than an aspiration goal. 2. Compliance is a journey and not a destination, which implies the creation of a culture wherein compliance is something you do as part of your organization's mission and not as some necessary evil. 3. Compliance is not an abstraction but rather is always manifested at the granularity level of a requirement. 4.3 the ability to track process results. 5. Agile is the only compliance methodology that matters; all others are anachronisms that belong in the dustbin of history because they are woefully inadequate for a rapidly changing complex world. 6. Every compliance regime is a wicked problem that contains an order of magnitude more organizational complexity than technical complexity, however the latter is ever present and almost always nontrivial. 7. The only way to improve an organization's compliance narrative is to improve its ability to produce visible, demonstrable, evidence of compliance over time, at the granularity level of a requirement. 8. Checklists that provide suggested policies, processes, and tracking mechanisms at the granularity level of a requirement prove invaluable because compliance regimes are (almost always) descriptive and not prescriptive (i.e. requirements inform you as to what should be done but not how to do it). 9. Analytical frameworks and modeling (often one and the same thing) are proven educational transfer vehicles when deciphering the meaning and/or intent of a requirement. 10. Scorecards based on specific requirements are the only way to measure progress of your compliance initiative (i.e. by definition, if you are in compliance with all the requirements of a regulatory regime then you are in compliance). Our Contingency Framework ("Framework") offers guidance for complying with this standard. With the Framework, you'll be able to determine what you need to do in order to satisfy these five implementation specifications ("Controls"). In addition, you are provided templates that help you mitigate the risks posed by the absence of these Controls. These Controls are now generally referred to as "Business Continuity." Business Continuity is a very complex topic; however, similar to the manner in which other wicked problems are attacked, the most important thing that any organization can do is to fail forward fast; that is, to put a foundational solution in place and then proceed to refine it over time as specific requirements manifest. Expresso® is an easy to use Risk Assessment software that allows you to identify security objects, risks, threats and vulnerabilities to identify impacts and assign controls at a glance! Expresso® will allow you to do all of the above, and so much much more! 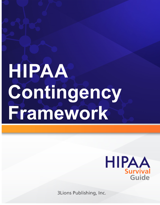 In addition the HIPAA Survival Guide Subscription Plan also includes Policies and Procedures that can be customized for your organization.